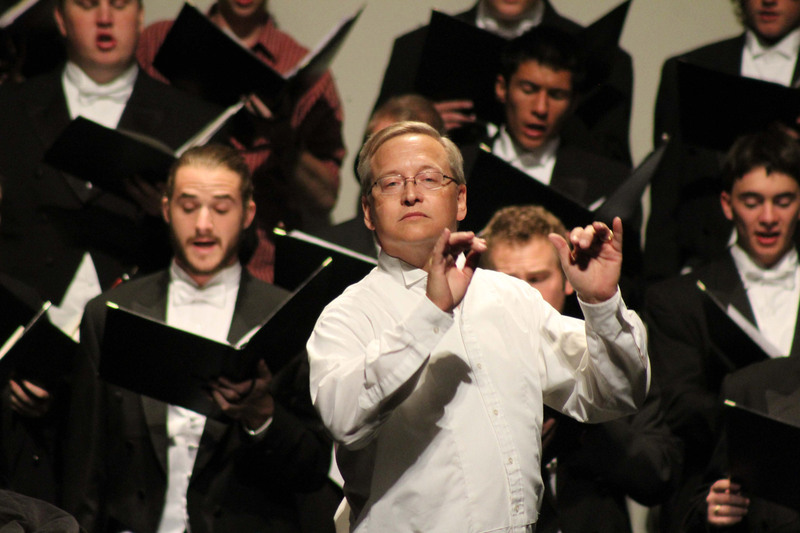 Almost like a dance, Kevin L. Baker begins to float his arms in the air, slightly swaying with eyes half closed, focusing on the music being performed by the Southern Utah University Opus Choir. These interpretive movements by Baker as the choir conductor hint toward the choir to stress a subtle phrase in the verse is an art form for him and clearly is to The American Prize who presented Baker with The American Prize in Conducting in the college/university division. This conducting master gives full credit to his students, who he said perform at such a caliber that he can then conduct at a higher level. Baker’s intricate and delightful style of conducting doesn’t just lead his choirs to preform bewitching pieces, it is also conducting the education and goals of his students, like Taylor Rowley, senior music education, who hopes his professor’s teaching style will carry through once he becomes a high school music teacher. The American Prize grew from the belief that a great deal of excellent music being made in this country goes unrecognized and unheralded, not only in major cities, but across the country. With the performing arts in America marginalized like never before, The American Prize seeks to fill the gap that leaves excellent artists and ensembles struggling for visibility and viability. The American Prize recognizes and rewards the best America produces. Winners of The American Prize receive cash prizes, professional adjudication and regional, national and international recognition based on recorded performances. Baker’s next performance with the SUU Opus and Concert Choirs will be it’s annual Holiday Concert December 4 at the Cedar City Heritage Center.